Editor’s Note: This story is from Working RE Home Inspector’s latest May 2017 print magazine! OREP insureds receive guaranteed delivery. In what may be one of the largest public judgments against a home inspector in recent years, a $300,000 jury verdict in the case of Mellem vs. Standard Home Inspections, Inc. et al. is a sobering look at what is at stake when an inspection is performed poorly and how little liability protection incorporating actually affords (Montana Fourth District Court, Cause No. DV-14-257). The suit names Standard Home Inspections, Inc. (SHI—name changed for privacy reasons), a corporate entity, and the entity’s founder, president, and sole home inspector, Tom Smith (name changed for privacy reasons). In what quickly became an exercise in “piercing the corporate veil,” this case provides a stark warning for inspectors who believe that incorporating is a foolproof way to limit their personal liability and protect their personal assets. The Mellems hired SHI, owned and operated by Smith, to perform a professional home inspection before they finalized the purchase of their home in August 2013. After purchasing the property, the Mellems discovered a number of defects in the property that were not disclosed in the home inspection report. The suit, filed by C.J. Johnson from the law firm Kalkstein, Johnson, and Dye P.C., alleges that Smith failed to identify grading and drainage defects, structural defects in basement framing and supports, evidence of long-term moisture problems in the basement, residual mold in the basement and attic, and defects in the siding and gutters. After gathering evidence, the plaintiffs focused much of their attack on the fact that Smith failed to note significant structural problems in the basement, including a missing king jack stud, missing structural headers, and large holes through joists, and more. The deposition of inspector Smith is revealing in regards to the alleged errors and omissions made about the property’s structural problems. In his deposition, Smith admits that he entered the downstairs bathroom and did not even look up at the ceiling. This caused him to miss, among other things, several openly exposed and readily-visible joists which were broken, had rectangular cuts and holes or were missing altogether. Smith ultimately claimed that he had no memory of seeing the structural problems during his inspection, causing the Mellems to argue that he “exercised no care” and “effectively skipped” this portion of his inspection while falsely marking the framing “acceptable” in his report. In addition to failing to mention any structural damage, the Mellems argued that Smith failed to report “extensive and significant evidence” of outside water intrusion and water damage in the basement, including efflorescence, also known as salt staining, rusted foundation wall metal, rust weep down the basement walls and stained and rotted wood. The deposition of the inspector regarding the water damage is also quite surprising. In his testimony, Smith admits to observing rusty metal in the foundation, rusty snap ties and a trail of rust “weeping downwards toward the floor,” but confesses that he did not take any pictures of these conditions or mention them in his report. Despite significant and readily visible evidence of moisture and water intrusion, including wood rot, he failed to call out the defects. The plaintiffs ultimately used Smith’s testimony to argue that the inspector had left large areas uninspected and had effectively “admitted negligence” with regards to the structural problems and the evidence of water intrusion and damage. Smith’s attorneys initially argued that much of what Smith was being sued for was outside of the scope of the home inspection, but as the case progressed they began to lean heavily on the argument that as a corporate officer, Smith should not be liable for the contract breach of SHI, the corporate entity, and consequently was not accountable for the alleged mistakes. Corporate officers and agents are shielded from personal liability “for acts taken on behalf of the corporation in furtherance of corporate goals, policies and business interests,” his lawyers argued. The lead attorney representing the plaintiffs argued that this rule does not apply in this case because “the exception to this policy is where the officer personally committed a tort: a wrongful act or an infringement of a right (other than under contract) leading to civil legal liability.” In other words, the corporate protection does not shield corporate officer Smith from personal responsibility because he himself made the error and/or omission. In other words, if an agent of a corporation or an LLC commits a tort, they can be held individually liable. A tort is defined by the Cornell University Law School as “an act or omission that gives rise to injury or harm to another and amounts to a civil wrong for which courts impose liability.” There are a number of different kinds of torts, and to the extent that a lawyer can prove that a corporate officer committed a tort, personal liability exists. The jury ultimately did find that SHI and Smith were negligent, and Smith conducted his home inspection in a manner that was “against the best interests” of his corporation, SHI. Smith was consequently held liable as an individual, with a jury finding that his poor home inspection performance constituted “unfair or deceptive acts or practices” which violated the Montana Home Inspection Trade Practices Act and the Montana Consumer Protection Act. Under Montana law the judge has the option of increasing the award by triple and awarding attorneys’ fees for any verdict that is a violation of the state’s Consumer Protection Act. The Mellems were awarded $300,000 in damages and attorney’s fees. The case was thereafter settled confidentially, but if the court had ultimately issued a ruling on the verdict, this amount could have been tripled to $900,000, plus attorney’s fees. LLC or Corporation: How Much Protection Is There? The case of SHI and Tom Smith is a compelling example of how the “corporate veil” can be pierced but it does not mean that corporate forms of organization are categorically useless for home inspectors. Indeed, the degree of negligence involved directly relates to how easy it is for opposing counsel to “pierce the veil” in the manner described in this case. In other words, if the inspector is grossly negligent and it is readily apparent to a jury that obvious defects in a property were missed, it is much easier to prove that the inspector should be personally liable. And it can be asserted that he/she acted against the best interests of the corporate entity. If the claim of negligence is not as clear cut, the plaintiff’s attorneys will have a much harder time proving personal liability. E&O insurance is really the only way to protect your assets, says David Brauner, Senior Broker at OREP. “I have been in this exact position. When I was forming OREP I asked everyone I could find for advice—my CPA, my attorney and my mentor at the Small Business Administration whether I should incorporate to protect the few assets I had at the time—namely my house. To a person, they all said incorporating may have other benefits but for liability protection, E&O is the best protection. That, and being careful,” Brauner said. 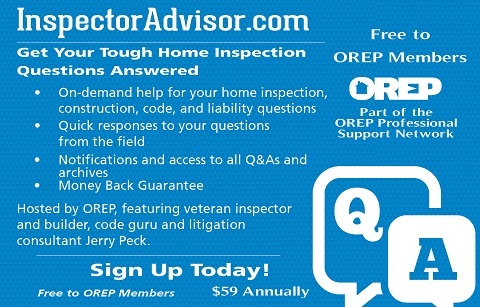 In other words, because home inspector licensing designates specific duties and responsibilities to individuals who practice as home inspection professionals, licensing also potentially subjects inspectors to increased liability because, similar to doctors, lawyers or accountants, licensed inspectors have “duties specifically imposed by law” which they are bound to as individuals. Just as a doctor working for a corporation might be held individual liable for violating his standards of practice, inspectors in licensing states are also bound by law and can be found liable under tort and contract theories if found to be Working RE Inspector Summer 2017 9 grossly negligent or acting in violation. It’s important to note that in Montana, the state where this suit occurred, there is no home inspector licensing program. However, Montana has passed the Montana Home Inspection Trade Practices Act, which outlines the duties and responsibilities of a home inspector. Despite the arguments against the effectiveness of incorporating for home inspectors, some experienced attorneys point out that there is little downside to forming a corporation. Doing business through a corporation has likely never made a home inspector more liable, they argue, and in some cases has successfully protected the inspector as an individual. So despite its less than ironclad protection, inspectors arguably are at least more protected when doing business in a corporate form. But incorporating may be more costly depending on your state. It’s best to ask your accountant. Todd Stevens, veteran home inspector trial lawyer and past President of the San Diego Bar Association, says that while not effective in every case, a corporate form can still be useful. “Corporate formation is an additional layer of protection for inspectors. You certainly aren’t going to be scot-free just because you incorporate but it is another layer of protection that I would never discourage anyone from doing. It’s especially useful if you’ve got a bigger operation with lots of employees and independent contractors working for you. There are advantages and disadvantages that vary by state in terms of taxes, so I’d definitely recommend speaking to an accountant and a lawyer to decide which form is best for you, but as a method of limiting your liability, it can’t hurt,” says Stevens. 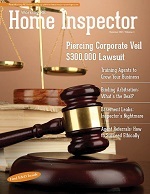 The issues explored here, admittedly, are not the only issues that come into play when a plaintiff attempts to “pierce the corporate veil” in a home-inspector related lawsuit. Lawyers frequently attempt to prove that an inspector’s corporation is a “sham” corporation, and there is no real difference between the inspector and the corporate entity. 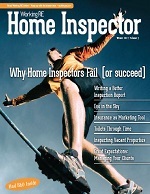 For this reason, home inspectors utilizing a corporate form are advised to observe the required corporate formalities, such as issuing stock, holding shareholder and board of directors meetings, keeping adequate minutes for meetings, and keeping separate financial records and separate bank accounts—ensuring clear financial boundaries between the individual and the corporation. The complexity of these issues is beyond the scope of this story, but inspectors interested in limiting their liability through a corporate structure should research them accordingly and seek professional legal advice. Stay safe out there! To read the suit and deposition in its entirety, click here. Great article and great writing. But what happened with the appraiser in this specific case of damaged structure in the basement? Was there an appraiser involved?